Useful, since not all of the US will get to see the eclipse in full. On Wednesday, parts of the US will get to view a very special lunar eclipse. 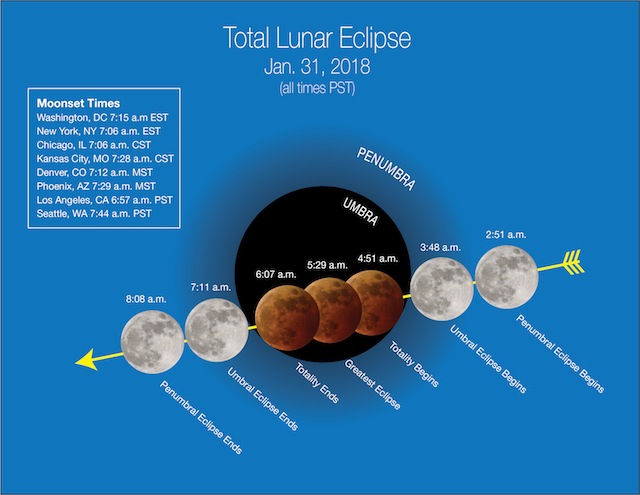 While typical lunar eclipses aren't terribly rare -- the next full one viewable from North America will occur in January 2019 -- this one combines a total eclipse with a supermoon and a blue moon, making it a sort of moon event triple threat. While not all of the US will get to see the entire eclipse, NASA will be televising it online and giving views from California and Arizona. A supermoon occurs when the moon reaches the part of its orbit that comes closest to Earth, making it appear around 14 percent brighter, while a blue moon is the second full moon of the month. These three events lining up at the same time makes this lunar eclipse particularly notable. Hawaii, Alaska and the West Coast will get to see the eclipse in full. But those in Mountain, Central and Eastern time will only get to view the beginning of the eclipse since the moon will begin dipping below the horizon before it's fully completed. The full event will take over four hours and the moon will be fully eclipsed by Earth's shadow for around an hour and 16 minutes. NASA will show views from its Armstrong Flight Research Center in Edwards, California, the Griffith Observatory in Los Angeles and the Mt. Lemmon SkyCenter Observatory at the University of Arizona. Coverage will begin at 5:30AM Eastern time and you can check it out here.